Talking Duck a Special Way. An Early advertisement for F.A. Allen's "Improved Duck Caller." and one of his boats. Calls by Allen, Ditto ,and especially Olt were copied by Cajun guides in local cane with the reed from a filed-down hard-rubber comb. "Dat little squeal at the en' of the call is special," said the late Clarence "Dud" Faulk as he sat at his bench on a cool autumn afternoon many years ago. "Oldtimers say dat dat soun' come from a hen with some age on her," Faulk continued in his lilting Cajun accent. "Others say dat's a hen mallard with her throat so full of food dat she squeak when she call. Dos' duck dat hear dat sound jus' naturally come, 'cause dey know dat ol' hen know what she's a doin'," Faulk stated. So was my introduction to one of the unique aspects of Louisiana-style duck calling. That long-ago afternoon took place in the late' 70s. Eli Haydel, who was then a fledging call maker, and I had met on "The Bus" at the World Duck Calling Championship, and at the time I was writing a great deal about calls and calling, and he invited me to come to Louisiana to experience its great hunting. During our time there we stopped by Dud Faulk's Lake Charles shop. Contrary to about everything written about Louisiana's best known call maker, "Dud" Faulk's first name wasn't Dudley, but Clarence, as was his father whose nickname was Patin. When pressed, Faulk couldn't really say why or how he got the nickname Dud, but Dud was it, and by it he went. Since that time, I've hunted numerous times in Louisiana, chiefly at The Hackberry Rod & Gun Club, south of Lake Charles, and there talk of legendary guides is not far from the surface. Duck calls came late to Louisiana. History and legend tells us that early hunters and guides called ducks by mouth. Thomas E. Walsh from Greenville, Mississippi won the first National Duck Calling Contest, now the World's Championship, in 1936 calling by mouth. Some made the sound much like Donald Duck by squeezing the air between their cheek and tongue, others by blowing against a clenched fist or others by simply voicing "Ank, ank, ank" or some other variation. I'm not sure if ducks can discern pitch, but they can certainly determine tempo and rhythm, which explains why all of these various methods of calling work. Still, it wasn't until hunters came from the north to Southwest Louisiana to hunt that duck calls began to be used. Characteristically, the cedar tone board of Cajun-style calls has a slight twist to add raspiness to the sounds. This one twists to the right, but if made by a left-handed maker would twist in the other direction. "We didn't invent calls, we copied them from hunters who came south to hunt," Dud Faulk said. In fact calls made upcountry from the Cajun's coastal marshes nearly all appear to be either Glodo- or Arkansas-style calls; Cajun calls are unique. "The first were copied from the Olt hard Rubber calls," Faulk said. Copies they were, but with a twist. "Cajuns can't grunt into a call like they do in Arkansas," Eli Haydel said, "So the rasp has to come from inside the call." Although he didn't invent the duck call, Victor Glodo gave the modern duck call its shape and style. Using a flat tone board and curved metal reed held to the tone board by a separate wooden wedge, Glodo's calls became identified with Tennessee's Reelfoot Lake area, and those with a curved tone board and flat hard-rubber reed became known as Arkansas-style calls. On the Mississippi River near Monmouth, Illinois, F. A. Allen made some of the earliest calls that used a flat tone board and a curved metal reed contained in a metal cylinder. His competitor Charles Ditto in nearby Keithsburg, Illinois made his calls with a curved tone board and flat rubber reed. Later on the Illinois River in Pekin, Illinois, Philip S. Olt made his hard-rubber calls that had a curved tone board and a flat hard-rubber reed, and it is likely that the Cajun guides copied a blend of the Olt, Ditto and Allen. But there's more to the Cajun call than that. Haydel said, "The sound tunnel is twisted on the end to add rasp to the sound. They had this little tool to shape the cedar tone channel. If the guy making it was right handed it twisted one way and if he was left handed it twisted the other accomplishing the same thing," Haydel said. The Cajuns are a dispossessed people. They were French Canadians, who because they clung dearly to their French language and customs, were ejected in the early 1700s from Acadia--Nova Scotia, New Brunswick, Prince Edward Island, Eastern Quebec and Maine--by the English Canadians, which I suppose is better than my wife's ancestor whom the British hanged on Ile D'Orleans for his Frenchness. Following a series of long voyages the Cajuns landed in Southwestern Louisiana. A happy, carefree people, they lived off the land, making whatever they needed from native materials. When Olt calls began arriving tied to the lapels of visiting sports, these Cajun craftsmen began copying them using whatever was at hand. The reeds were made by filing down the back of a hard-rubber comb, the barrel and insert from native cane and the tone board from cedar. Because cane easily splits, calls were frequently reinforced using the brass heads from fired shotshells. Not of the volume of the calls from upriver, Nash Buckingham called them "Twittery cane affairs". The sound carried well across the open coastal marshes and coaxed clouds of wintering ducks to hand-carved decoys. The late Clarence "Dud" Faulk (foreground) and Clarence "Patin" Faulk calling from their blind near Lake Charles, Louisiana in about 1960. Dud Faulk made--his granddaughter now carries on the family business--several cane calls, but the select ones were his Black Label cane calls whose labels proclaim, "Made especially for guides and hunters of Southwest Louisiana." "Dat call give you Hell boy," Faulk said when I asked to buy one. Made of native cane--"I grow cane all around Lake Charles," Faulk said--they blow very lightly, not much is air needed, and the notes easily end in the squeal of "Dat ol' hen mallard." In an effort to better understand the style of calling the old Cajun guides used, I spent some time with Terry Saughnessy, the founder of the Hackberry Rod & Gun Club, and my old friend Eli Haydel. Saughnessy is a giant of a man who played center for the expansion Miami Dolphins, but then feeling a higher calling, joined the Army as a Special Forces officer. He picks up the story in 1972. "When I came back from my second tour in Vietnam, I decided to come to southwest Louisiana to just hunt and fish," Saughnessy said. There was a place called Chateau Charles that was run by Rick Murdock; the biggest duck club around Lake Charles. I was soon hired as a guide at $22.50 a day plus a $10 tip," he said. "That worked out to about $900 a month, to hunt ducks!" Saughnessy exclaimed. "Within a week, I was put in charge of 10 hunters that I would take every morning to a place called Boone's corner. It was a store near the marsh that Amos Faulk, part of the Faulk family who made cane calls, hunted. "One of the guides there was Camille LeJeune," Shaughnessy said. "Camille was a robust man, as wide as he was tall, who caught catfish in the summer and guided duck hunters in the winter. He lived on a houseboat out on the marsh, and put himself through life living off the land," Saughnessy continued. "By the time I met him, Camille had been doing this for 50 years! He only wore overalls, hip boots and a shirt. He had a hunting coat that started off as what we now call sage, but was bleached to tan by the sun. Camille had a big, loud voice and spoke only French until he was about 10 or 12 when he started guiding hunters," Saughnessy said. "At best he spoke heavily accented, fairly broken English. 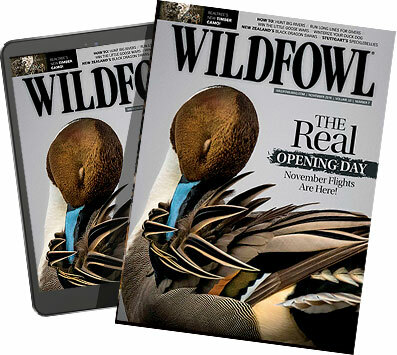 "They [hunters in southwest Louisiana] have all the calls: They have a pintail whistle, greenwig and bluewing teal calls , a mallard call," said Eli Haydel. Guide Kirk Stansel carries all those calls every day of the Louisiana duck season. "It's politically incorrect to say now, but every morning when he arrived at Boone's corner at 4 a.m., Camille would buy a half-pint of whiskey, take a slug, and go meet his hunters for the day. When Camille died, I don't remember the year, they buried him in his overalls, hip boots with his duck calls around his neck, one hand on a half-pint of whiskey and the other on his shotgun. "We had lots of pintails then," Saughnessy continued, "and Camille and the other guides used a little whistle where you could put your finger in the back and make that little toot, too-toot, that pintails make. For geese, Camille called only by mouth. He had a whistle and two cane calls around his neck, and those cane calls were hard to blow. They were easy to squeal out; you couldn't blow them very hard, and they sounded very soft. Camille LeJune was a classic, you'll never find another like him." It was Eli Haydel, one of America's most successful call makers, who makes a Cajun Squeal call, who introduced me to both Dud and Amos Faulk. While I was hunting at the Hackberry Rod & Gun Club in 2004, I dropped in at Haydel's duck camp that is on the opposite side of Lake Calcasieu from Hackberry. I asked him about the legendary squeal-style of calling. "I believe the best callers I've heard, those who can really work ducks are in this area. They have all the calls: They have a pintail whistle, greenwing and bluewing teal calls, a mallard call, and most important, they make the sounds the ducks make. The late Clarence "Patin" Faulk father of "Dud" Faulk, perhaps Louisiana's best-known call maker. "The squeal type of calling came from rice farmers and those who lived on the marsh who heard the mottled duck and mallards all year long. I guess it was a macho thing to be able to make the squeal. I know lots of local guys who would not have a [mallard] call that wouldn't squeal, and very few of them ever gave a long call; nothing over seven, five or four notes. But then they knew how to work ducks . . . how to read ducks. They all knew their turf. If there's duck coming from the east, I won't call that duck. Experience over the years has told me that it won't do any good. Remembering what worked, what didn't and be willing to try something new, that's the key to success calling ducks. I will give them a five- or seven-note call, maybe on the high end of one of our variable-tone calls, and that will often really bring them. You'll hear guys on the marsh going quack, quack, quack over and over again, and that does no good because it doesn't sound like a duck. When a duck is circling I'll watch that duck and when he's starting to go off, I'll lay on the call. If he looks hesitant, I'll call him right into the blind. If not, I'll ease off," Haydel said. According to Haydel, this sound originates from, "Ducks feeding on a rice field or elsewhere who have loaded up their crops, and that constricts the vocal cords. When ducks flying overhead hear that sound they think it was a good place to find groceries. Here's another thing about those calls. Most all of them were high pitched, and in the market hunting days, many hunters used English call ducks, who had higher pitched quacks. And what does it take to call a mallard in? Those high-pitched calls. It's logical to me. Although," Haydel continued, "In those early days there were so many more ducks, and Amos Faulk told me that they'd watch the ducks to see where they went, and then go set up there the next morning. Those were some salty people. They'd push a pirogue four or five miles through the marsh to get to where they wanted to hunt, then when they were through, they'd clean the ducks then go run their trap lines . . . that's full day," Haydel exclaimed. Eli Haydel, the very successful Louisiana call maker, who discussed the history of Cajun calling with the author. When I asked Haydel how to make this elusive squeal he said, "What you try to do is lock that call down. It's almost like you're trying to choke the call. You want it locked down about 99-percent. You've got to purse your lips too," he said. "I use the word 'ha vit' and that last bit helps make the squeal. Then it's a matter of practicing, and it will take a long time; and finally you'll get one note to squeal, then another. The squeal is just at the end of each note, a kind of little squeak at the very end of the sound." 004, "The most important thing out here on the marsh is sounding like a duck. We're the last stop on the migration, and by the time they get here the ducks have heard every kind of call and every kind of calling from Canada on down, so we have to try to imitate how the ducks sound on the marsh," Stansil said, "It's the only way . . . Get down, here come some right now!"